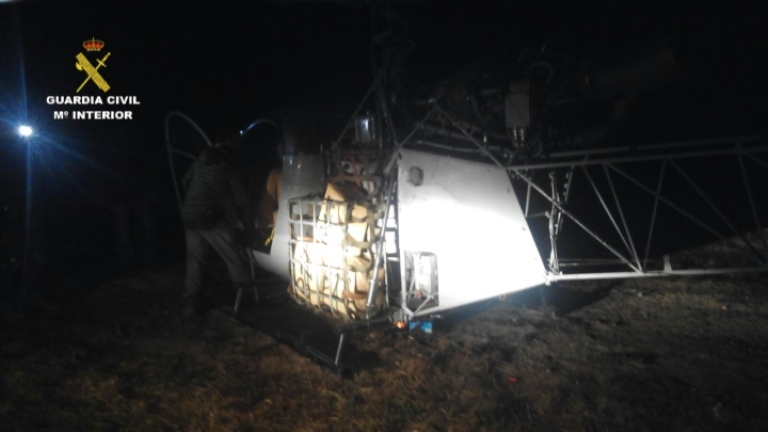 [electronic translation] The Civil Guard, under the hemming operation, has been arrested in the provinces of Seville, Malaga and Cadiz to 20 members of a criminal, perfectly structured and hierarchical organization dedicated to introducing hashish in Spain from Morocco by air. Altogether they have seized 615 kilos of hashish hidden in a helicopter were from Morocco and 7 records made ​​in different homes and farms of these Andalusian provinces have been seized six cars, one stolen SUV, 2 trailers and gun and municionada ready for use and another helicopter after a disaster became unusable and buried to prevent it from being located. The operation began after detecting the output of a helicopter flying at low altitude and without any lights , so they launched a device in which they are activated, among others, the Helicopter Unit of the Guard Civil and Reserve and Security Group. Once airborne and after several surveys of area, the helicopter Civil Guard managed to locate the suspect aircraft flying at very low altitude and heading to the mainland from Morocco, so he proceeded to track and then to intercept it when it he was about to download the drug in a farm located in the Natural Park of the Acorns (Cádiz), also achieving the arrest of the pilot, copilot and a third person responsible for the custody of hashish. The helicopter pilot, of Ukrainian nationality, working at home and helicopter pilot firefighting and had extensive experience in night flights. From the moment of interception of the helicopter, the arrest of these three individuals and the seizure of 615 kilos of hashish, a second phase of the operation that began at the other 17 leaders of the organization he was arrested . The complex investigation has allowed to dismantle the criminal organization full investigation, which also provided an important logistics arm, with a transport company in the province of Cadiz, which was responsible for carrying out the continuous movements of aircraft to various farms and warehouses where concealed helicopters before and after drug downloads. In one of the farms in the organization officers they found another helicopter buried several meters deep, a backhoe to remove it completely still needed. The helicopter had been buried by criminals after suffering an accident in which it was useless as they prepared to take off for Morocco to carry a significant amount of drugs to the peninsula and thus prevent it from being located. Both helicopters are operated ALOUETTE II type. They are single-engine light helicopters manufactured in France, acquired by the criminal organization abroad. This type of helicopter can accommodate four passengers, while traffickers often take the back seat to transport as much dope, charging approximately between 300 and 400 kilos of hashish in the passenger compartment. 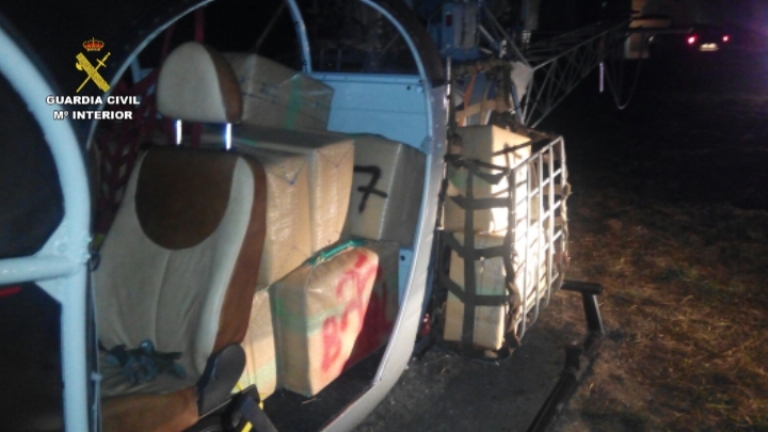 In this case the organization had made ​​some structural changes in the helicopter to increase the volume of cargo transported drug in each of the trips made ​​by incorporating a wire baskets each side of the aircraft thus allowing increased by 200 kilos total capacity. The operation was carried out with the Drug Prosecution of Seville and the Court of Instruction No. 4 of Dos Hermanas, all detainees being put in custody of the latter, ruling the said court on remand admission twelve components of the organization. The hem is included in the operation plan called TELOS, in which the Civil Guard integrates its capabilities to control coastal areas, using their sea, land and air assets as a way to adequately fight against drug trafficking . Since the activation of the plan in 2013 and as a result of their different stages of implementation in Andalusia, 12 aircraft have been intercepted, seized almost four and a half tons of hashish, and have arrested 30 people. The following three photos issued by Guardia Civil show how the Alouette rear seats were removed, cargo baskets added, and so on.